We all know that the fashion industry has a diversity problem and despite some positive findings in our 2016 magazine diversity report, the newsstand still has a long way to go towards inclusiveness. Thankfully, we’ve seen some notably diverse cover stars on magazines so far this year. American Vogue started 2017 with Ethiopian-Irish actress Ruth Negga, Allure delivered a delightful cover embracing models of color for April, Ashley Graham flaunts her curves on the current edition of Glamour, and hijab-wearing model Halima Aden starred on several covers, including this month’s Allure. It was ultimately Vogue Paris who broke a major barrier in March by becoming the first-ever edition of Vogue to feature a transgender model on the cover, with Brazilian stunner Valentina Sampaio getting the honors. Now, the community scores another win as Andreja Pejic fronts two major fashion magazine covers this month. Andreja’s first addition to her ever-growing portfolio is the July 2017 cover of Harper’s Bazaar Serbia (below). Photographed by Dusan Reljin, Andreja works her magic in the arresting cover image wearing an Eric Javits hat teamed with a Fleur du Mal dress and a killer stare. 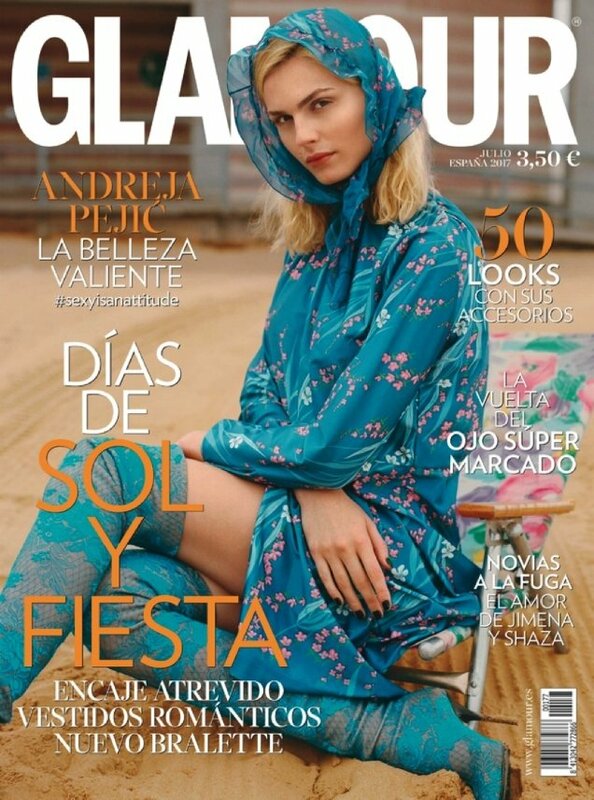 The Australian beauty’s second cover is for Glamour Spain, delivering something completely different from the Bazaar cover. Appearing subtle and demure on location at Coney Island, Andreja models one of Balenciaga’s most coveted looks of the season, photographed by Rebekah Campbell. Here’s hoping there are many more covers to follow for Andreja.